I was noticing, a while back, that my computer and I have some things in common. In particular, we are seriously similar in how we act when we get sick. Here are 10 ways that a computer virus is like the flu, or, if you like, 10 ways my computer with a virus is like me with the flu. Almost Functional. When I’m sick, I always feel as though I should still be able to function. I get up to do something. I try hard to remember what I was going to do after I get up, I say to heck with it, and lie down again. My computer does the same thing. It boots up. It tries hard to remember what it was going to do, and then it displays an error message and gives up. Whiney Messages. My computer acquired a virus and began sending out urgent messages to everyone in my address book. That’s just like me, too. I get the flu, and immediately start calling and text messaging everyone in my mobile phone contacts to whine about how rotten I feel. Feverish. When my computer has a virus, it tends to run a bit hotter than is normal, very much like me when I get feverish from the flu. Neither of us functions well at all, with a fever. Delirium. When I become feverish, I begin to have strange walking-around dreams while half-asleep, talking to people that aren’t there and ignoring people that are. My computer appears to have some of the same issues, as it ignores me and responds to the voices in its mother board. Wheezy Respiration. Because it runs hot when it has a virus, the computer hard drive and fan sound as if they are laboring to breathe. A rasping and cyclical series of wheezes and sighs issues forth with every click of the mouse. I’ve been told that I make similar noises when ill with the flu. Stubborn. My computer becomes very stubborn when it has a virus. It tries to work when it shouldn’t, if refuses to do what it should do, and is generally very uncooperative. Now, you may be as skeptical about this as I am, but my wife insists that this is another characteristic that the computer and I share, when ill with a virus. I include this on the list only in order to allow her to feel as if she’s helped with this article. Crashes. Yes, both of us do this, after an exhausting bout of trying to accomplish something while ill. I tend to crash and spill while preparing chicken soup. The computer tends to crash and delete while preparing important documents. Annoying Doctors. Both the computer and I, when sick enough, go to doctors that that have tendencies toward nagging. My doctor goes on about healthy living and flu shots. The computer’s doctor goes on about healthy web-surfing and anti-virus programs. Overnight Hospital Stays. There have been times when the flu has caused an overnight hospital stay, hooked up to monitors and saline drips. It’s the same for my computer. 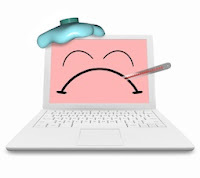 The last time it had a virus I had to leave it in a cold and uninviting room overnight, hooked up to a machine. The only thing missing at the computer hospital was a nurse to wake it up and poke at it every few hours. Infectious. Yep, the last time I was sick with the flu, I began showing symptoms after I was already at work, and managed to pass it along to several coworkers. The same thing happened with my computer, and I know of several friends’ computers that had to spend overnight time at a computer hospital, afterward. One even had to go in for an emergency hard drive transplant. So, there you have it; 10 ways that a virus makes my computer act the same as I do when I have the flu, though I’m still not certain that number 6 really belongs on the list. Hey, I am greatly impressed with this post. Computers offer new opportunities, which in turn opens up new possibilities for action. What you have shared here are actually in great use, in today's computer influenced world, almost everything needs computer support, computer plays a very vital role in almost everybody's life, that is why it is simply important for many to keep updates and learn the most essential part of computer issues and assesment.